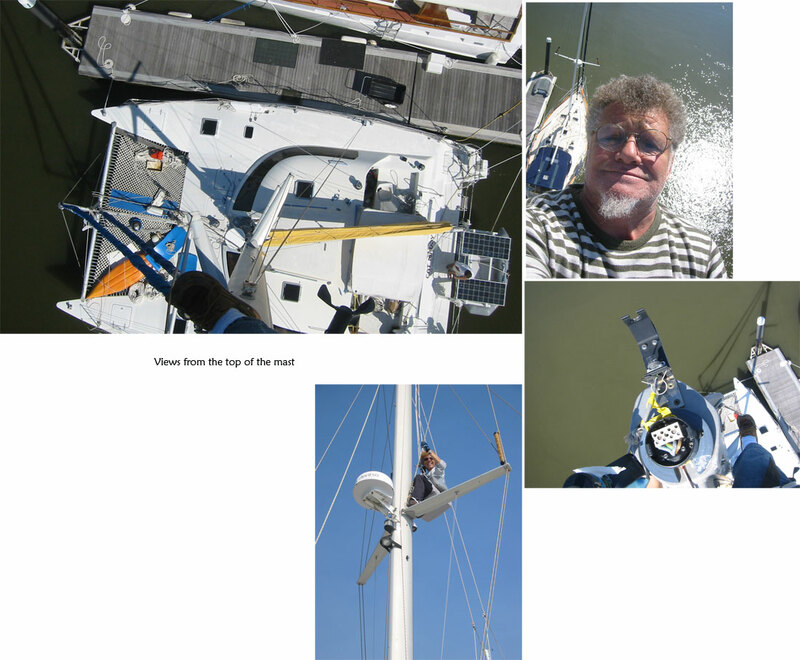 It was a rare calm day, and Pat had to install the tri-color light onto the top of the mast. This light fell off (and broke) when Cat Maudy had a brief encounter with the top of a bridge along the intracoastal. Unfortunately, the NEW tri-color light, was of a slightly different design from the OLD tri-color light. This meant that more than 1 trip to the top of the mast would be required. Three trips to be exact. Pat was lookin’ like an ol’ pro going up the mast. I had him secured with the halyard and a second safety line – and equipped with my Rambo “powerdrill” to do all the heavy lifting. The third trip up the mast was the “charm” – and the new tri-color light was successfully wired and installed at the top of the mast. Now, it’s my turn. I decided this sure looks like fun. Ok – I didn’t go all of the way to the top of the mast, but I have to admit it was pretty cool bein’ UP – even if it is only barely halfway. The most amazing part, is that while hanging out in the bosun’s chair – sittin atop of the world…the dolphins whom have never more than just come up for air…put on a SHOW for me. That’s what I believed anyway. It was like being in front row seats at Sea World! Two dolphins were doing their “Flipper” routine — completely coming out of the water – in pairs, arching…and then diving. Again and again. It was a magical moment – and I’m gonna get further up the mast next time!